Fanfreundschaft is, as I understand it, a German phrase for official (or semi-official) fan friendships between sport (usually football) clubs. St Pauli, for example, have long-established Fanfreundschafts with 1.FC Köln and Celtic while, according to the excellent Abseits website, 'additional contacts have been reported with Duisburg, Mainz and Boavista'. 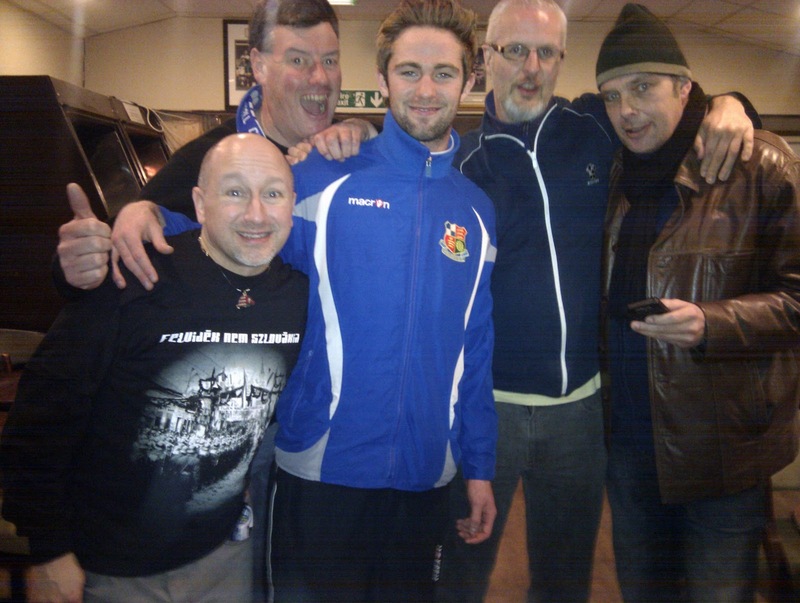 It all seems a bit odd to me, but then Maidenhead United (or, more accurately, the KSG) have a Fanfreundschaft of our own (kind of) with Wealdstone FC. The Stones, who in 1985 became the first side to achieve the 'non-league double', are not everyone's cup of tea. A case, I suppose, of 'no one likes us, we'd don't care'. 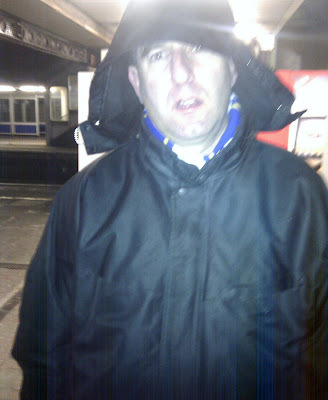 Grim (the 'Wealdstone Murdo') apparently remarked, not long after our first meeting, that "It's really odd, as we usually hate everyone, but you lot are alright". Praise indeed! 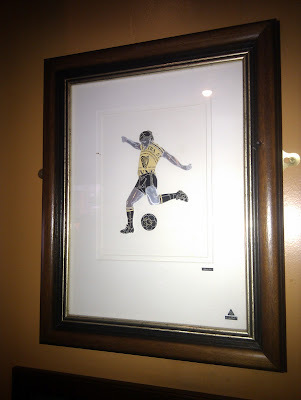 As far as I'm aware, the Fanfreundschaft was started by chance during a boozy session in the White Lion, Edgware, after our 3-0 win there in January 1999. I remember Stones keeper Noel Imber's clearance had bounced off Mickey Creighton's arse, to put the Magpies ahead after about a minute, before a spectacular thunderstorm lit the sky in the second half. 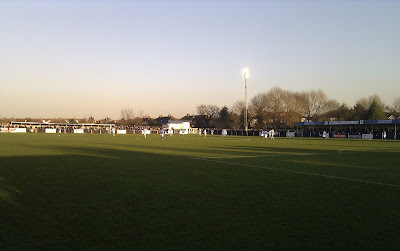 The Stones would comfortably win the return game, at York Road, in April. 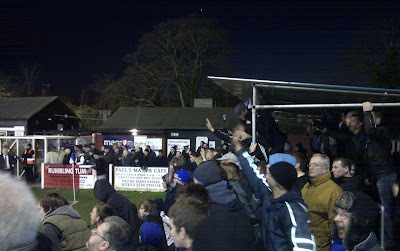 I recall it was a balmy spring evening, with the away following large and vocal. Wealdstone were pushing for promotion (from the Isthmian League Div One), and would eventually finish third (one point off second-placed Hitchin; 14 points ahead of fourth-placed Braintree). They were denied promotion, however, due to ground-grading technicalities. Murdo - wearing a Maidenhead United shirt - would attend a protest (ironically at Harrow Borough) against Alan Turvey and the Isthmian League blazers, cementing a sense of mutual respect between the two sets of supporters. A load of us (including Craig, Paddy, Scouse Mick, Willie T and others) would attend Stones Aid II (getting our guests' anti-Harrow Borough juices flowing with a lusty rendition of "A group of blokes from Marlow went to Rome to see the Pope"), while Murdo's band The Rigsby's would play at Stones Aid III. I also recall a couple of supporters games (Trevor Kingham played and Georgie T scored an absolute screamer, in one comprehensive defeat, which was no disgrace as they have teams playing in Sunday leagues). Furthermore, it was not uncommon - at least for a time - for Stones fans to turn up, en mass at York Road, when they didn't have a game. I remember being in the Bell End, one rainy Saturday afternoon, when the referee gave a decision against the Magpies; Grim and the rest of the Stones leaped forward to loudly remonstrate, before turning around and lambasting us for our lack of passion. These guys were criticising the likes of Murdo for not sufficiently chastising a match official?? A real eye-opener. As was Saturday 20th January 2007. 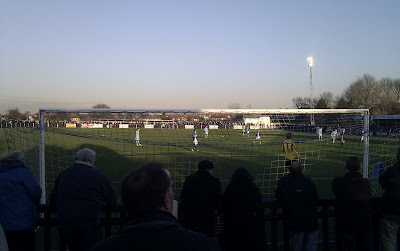 Wealdstone vs Maidenhead United. The Magpies, in the Southern League Premier after relegation from the Conference South, had lost twice in a week to bottom-of-the-table Corby Town. We weren't far off the relegation places and captain Dominic Sterling had taken it upon himself to apologise to supporters in the Advertiser. Macleod (M) was banned (after a barrage of fruity language during the pathetic 1-0 defeat, in front of 153 people, at Cirencester Town the previous month). The mood was far from great as Bobby P (I think), Les, Logic, Macleod (C), my Dad and I walked from the nearest tube station to Northwood Park stadium, where Wealdstone were then playing their home games. Manager Johnson Hippolyte didn't seem to know what he was doing; playing Delroy Preddie in goal, instead of Chico Ramos, for a start. If Drax's useless mate Preddie again got the nod, we were going to sing Chico's name throughout, we'd decided. As it happens, Preddie injured himself kicking a divot early on and was replaced by Chico, much to our delight. With ex Manager Carl Taylor also watching on, United romped to a 3-0 win and only lost two of their next 22 league games en route to a memorable Play-Off Final victory over Team Bath at Twerton Park. Anyway, I'd been looking forward to a catch up with the Stones lot. Yet hardly any of them were there, with the irrepressible Megaphone Mick being the notable exception. Disappointing. 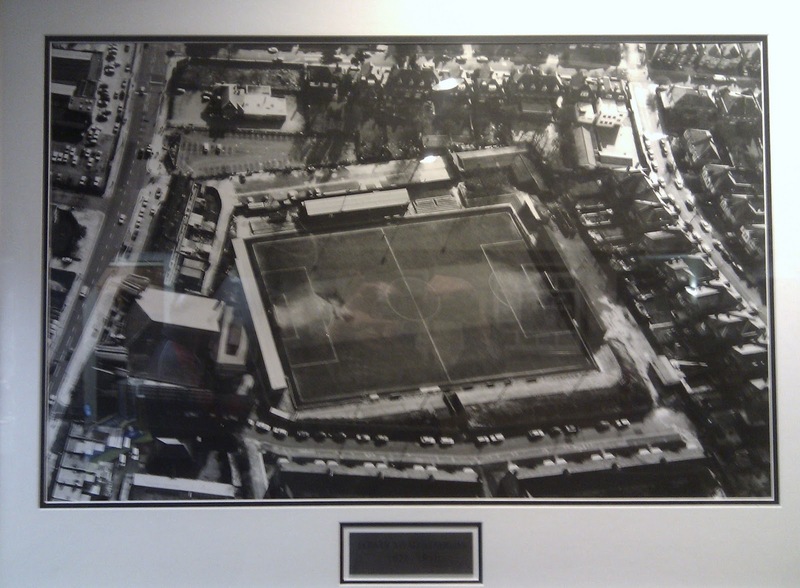 Promotion to the Conference South meant that we haven't crossed paths since a 3-0 Magpies win, at York Road, in March 2007 (when, again, the Stones presence was minimal). It was sunny but cold - with a thick layer of frost covering the ground - as we left Maidenhead, changed at Ealing Broadway, then Ealing Common, and finally Rayner's Lane (I think it took us as long to get from Maidenhead to Ealing Broadway, as it did to get from Ealing Broadway to Ruislip Manor!). A quick couple of photos, then pints in Hennessy's (not great, framed can art aside) and the local Wetherspoon's (decent enough, with a fair few Barrow fans inside) before a kindly, silver-haired, passing Wealdstone fan (who's name I have momentarily forgotten, but began with an 'M') recognised Murdo and offered to walk us to the ground. 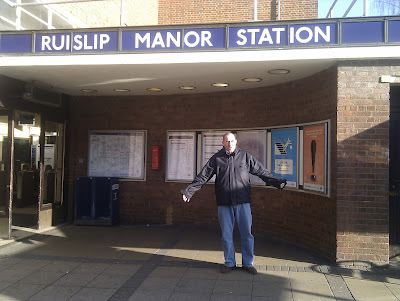 ^^^ Taking liberties on your (Ruislip) Manor. ^^^ Can art in Hennessy's. 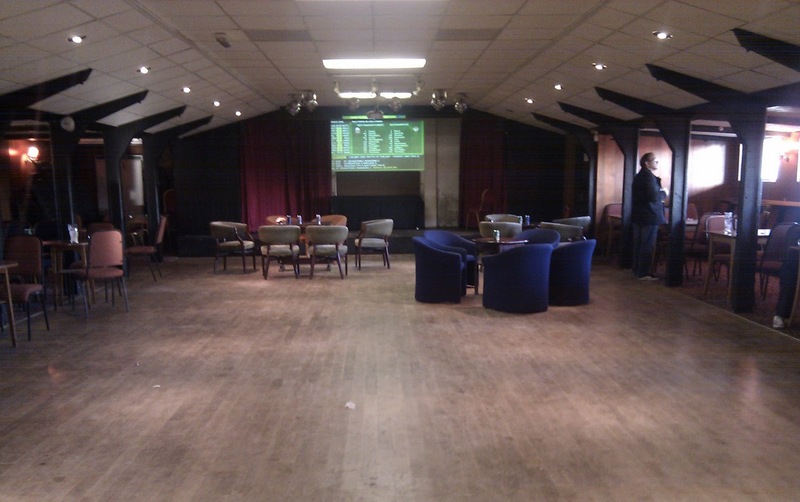 ^^^ Another venue that has hosted the singing talents of one Macleod (M). Gradually, the familiar Stones faces began to appear: Megaphone Mick, Dave P, Sudhir, Grim, Hillsy and others. Plus there was another familiar face in Lee Devonshire; scouting upcoming opponents and running the rule over loanee Britt Assombalonga on behalf of his father, Alan, the ex Maidenhead and current Braintree manager. 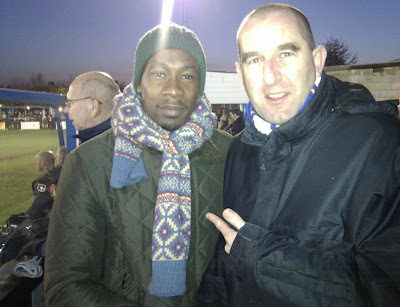 It was really good to chat with Lee; about agents and Kerthney Carty and Victor Asombang (thankfully we didn't sing "Oh Victor, Victor ... " too loudly, as it transpires that he now plays for you-know-who!) and how close Dev had come to returning to York Road before Drax got the job. 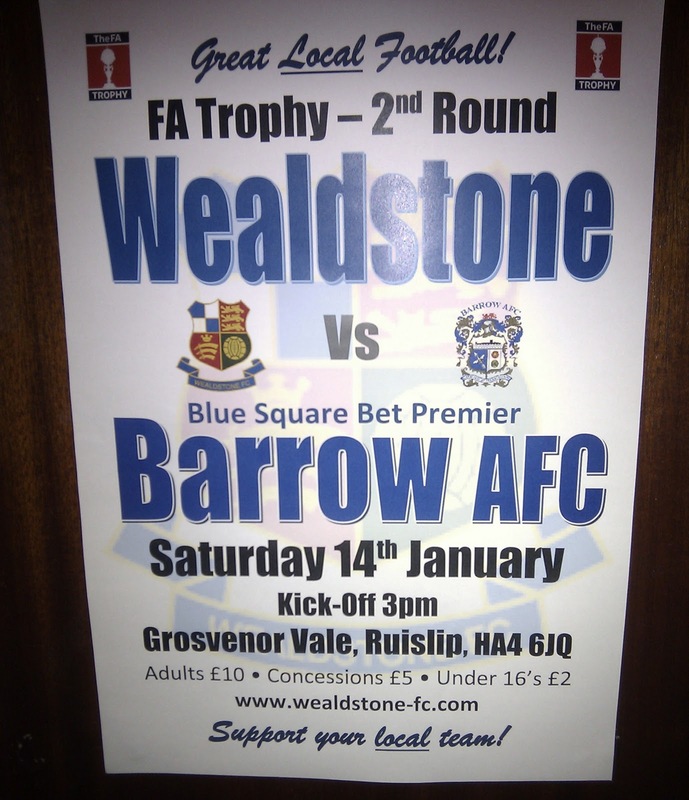 He identified Wealdstone's James Hammond and Barrow's Adam Boyes as players to watch ... and he wasn't wrong; both caught the eye (particularly the former). Murdo and I had only just finished our lunch, purchased from the burger bar close to the vocal away fans, when the game was interrupted by a head injury to Barrow keeper Danny Hurst ("Danny, Danny Hurst. His name is on the team sheet first"). There was just enough time for the Barrow fans to mock a couple of yellow-booted Wealdstone players ("Sports Direct, were having a sale" and "You got the worst boots, in the sale") before the ref took the players off and the game was suspended (for nearly half an hour, as it transpired) while an ambulance was called. Most of the crowd retreated to the bar. ^^^ "You'll never beat Dom Sterling!" ^^^ "Gordon Bartlett's Blue & White Army"
^^^ Stones goalkeeper Jonathan North celebrates with the fans. Neither Murdo nor I knew (or really cared) what the Maidenhead score was (Grim later found out that the Magpies had lost 2-1 at Havant & Waterlooville, but it was only 48 hours or so later that I discovered we had conceded two late goals to a side that played over half of the match with ten men!). Grim said that this was a shame and I agreed with him. 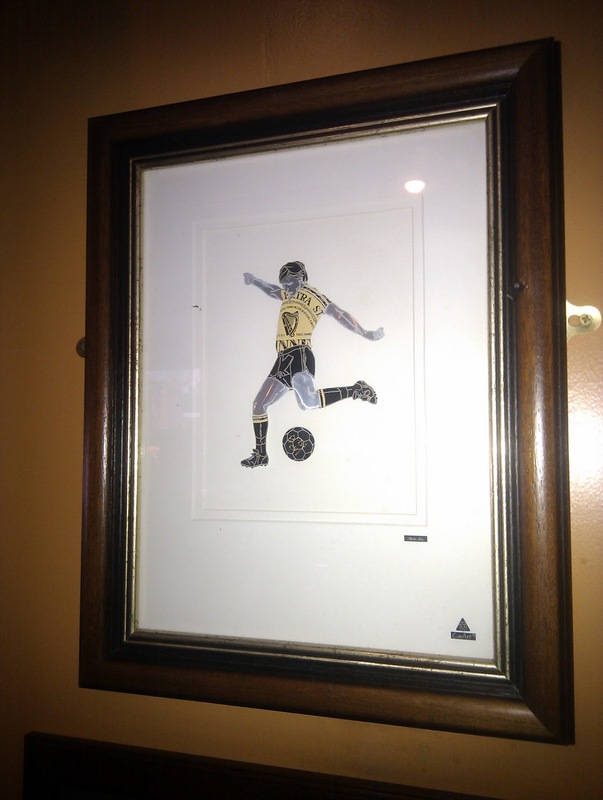 Then again, as I pointed out - Megaphone Mick aside - none (or very few) of the Stones lot had been at the 3-0 'Preddie kicks divot' game back in 2007. A low period for them, it would seem. Five years on and they are back, with a vengeance. Hope, then, for Murdo and I? Maybe. Memories of the night then became rather hazy, as we too were ushered into the Board room and the excessive Guinness consumption continued unabated. In fact, it was probably more by luck than design that we made it home without too much difficulty! My head was pounding the following day, but I was cheered to see a Facebook message from Grim - to Murdo and I - featuring the words 'great day' and 'kindred spirits'. Wealdstone drew Dartford away in the next round of the Trophy. Rather apt, bearing in mind it was after our game at Dartford last season that we had bumped into Grim and thereby re-ignited the Fan-Freundschaft. I wish him and the Stones (and Danny Hurst) well. Ruislip Manor FC was known in the fanzine as The Land Of Scaffold Poles, from which their main stand was constructed. 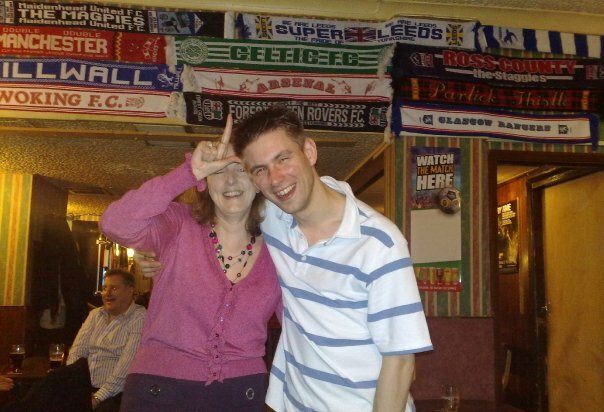 Loser's hatred of us stems from us rocking up there (nearly as many as we took to H&W on Saturday) complete with MUFC flag, to support RMFC against LBFC in a relegation 6 pointer. Loser won (a real misnomer) and we chanted about how they were both going down. Loser did, thankfully. Mid 90's? "Helping other supporters appreciate what they have"